Here is a photo from 2015 showing TCG Akın sailing through Bosphorus. Today the long career of TCG Akın in naval service has finished. The ship can have a well-earned rest after 75 years. 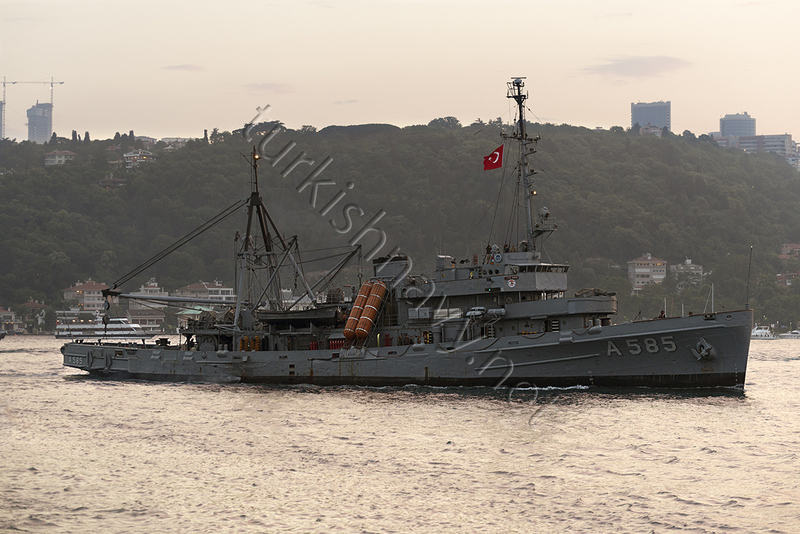 TCG Akın began her life as USS Greenlet, a Chanticleer-class submarine rescue ship in the United States Navy. She was launched in 1942 and served in US Navy during World War 2, Korean War and Vietnam War. She was even in Tokyo Bay when Japan surrendered in 1945. On 12 June 1970, she was decommissioned from US Navy service and immediately commissioned in Turkish Navy at Pearl Harbor Naval Submarine Base. Her transfer to Turkey took 40 days. She was the sole dedicated submarine rescue ship untill the commissioning of TCG Alemdar in 2017. I wish this old and elegant lady to be restored as a museum but most like she will either sunk during an exercise or scrapped. This photo show 4 new constructions for Turkish Navy. 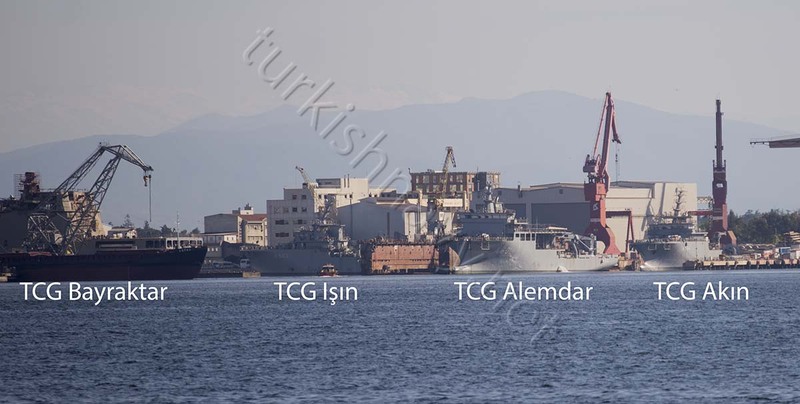 The two large rescue ships TCG Işın and TCG Akın, the submarine rescue ship TCG Alemdar and the new LST, TCG Bayraktar can be seen on the above photo. They are in different phases of construction. TCG Alemdar was first to be launched in April 2014. She was followed by TCG Işın in June 2014 and TCG Akın in September 2014. The first ship supposed to be delivered in 2015 but apparently there has been some delays in the project. These 3 ships are very complex due to the highly technical and very specialised rescue and salvage equipment they are going to carry. The procurement and implementation of these highly complex devices is in the hands of the shipyard. Since this project is first it’s kind, some unseen problems may be natural. TCG Bayraktar is the first of the two new landing ships Turkish Navy has ordered. She was launched in October 2015. When finished, she will carry 350 persons, 20 MBT and between 24 – 60 vehicles. The closed parking area is 1100 square meters and the open deck parking area is 690 square meters. 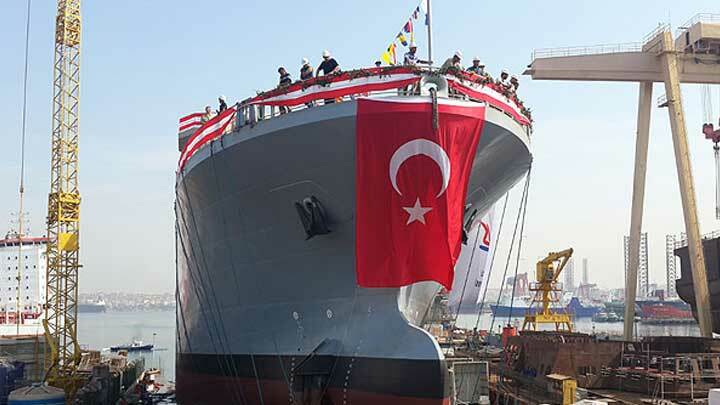 After TCG Bayraktar was launched, the construction of the second ship TCG Sancaktar has commenced on the slipway. I know this headline is confusing as there is already one ship named as TCG Akın in Turkish Navy inventory. But apparently her days are limited. The ship today launched is the second of the two RATSHIP (Rescue and Towing Ship) Istanbul Shipyard is constructing for Turkish Navy. Istanbul Shipyard a private company, was selected to build one submarine rescue ship and two salvage and rescue ships by SSM in June 2010. The submarine rescue ship A-601 TCG Alemdar was launched on 29 April 2014. 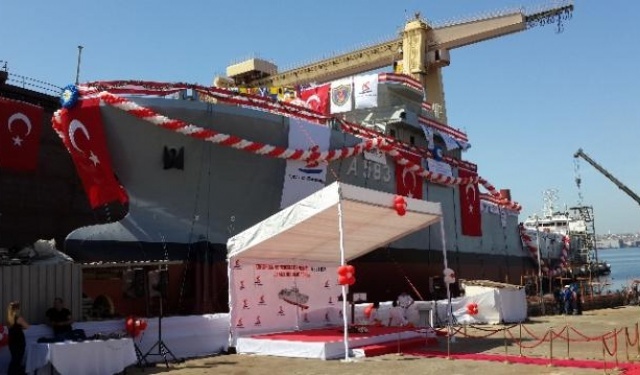 And the first RATSHIP, A-583 TCG Işın was launched on 25 June 2014. According to the press release of Undersecretariat for Defence Industries, the rescue and Towing ship will be capable of towing the broken down, wrecked and ran ashore ships as well as fire-fighting. Moreover, she, which will be equipped by the modern rescue systems and equipment such as remotely operated vehicle (ROV), atmospheric diving suit, submarine ventilation system, pressure rooms etc., can also perform the underwater repair works and wreck removal. The complete design, construction, outfitting and integration of the Rescue and Towing Ship are being performed by Istanbul Shipyard. In this scope, the total industry participation and offset percentage of 65% enables the utilization of Turkish industry capabilities through the acquisition of the construction material and services as well as most of the systems integrated on the vessel. I know this headline is confusing as there is already one ship named as TCG Işın in Turkish Navy inventory. But apparently her days are limited. The ship today launched is the first of the two RATSHIP (Rescue and Towing Ship) Istanbul Shipyard is constructing for Turkish Navy. Istanbul Shipyard a private company, was selected to build one submarine rescue ship and two salvage and rescue ships by SSM in June 2010. The submarine rescue ship A-601 TCG Alemdar was launched on 29 April 2014. The new A-583 TCG Işın will be handed over to Turkish Navy in January 2015. That means the days of the old and veteran A-589 TCG Işın are limited.